Inappropriate language is not acceptable at any time, to either members or employees of Abridge. Smoking is only permitted in designated areas;please ensure you always use the ash trays, not leaving butts on the floor. The guidelines for good golf etiquette are there for several very important reasons: Many of them relate to the safety of golfers, many relate to pace of play (which helps keep the game enjoyable), and other rules of golf etiquette relate to maintaining the quality of the golf course. In other words, golf etiquette is an essential part of the game. And it’s something that newcomers to the game often learn as they go – on the course,when playing with more experienced golfers. If you are new to the game, or just need to brush up on your golf etiquette, here are some basic rules that will help keep the game enjoyable for you and those around you. When practising your swing, never swing in the direction of another player. 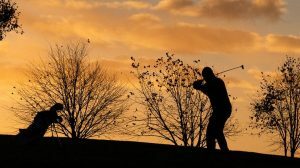 There may be pebbles or twigs or other matter in the grass that could fly up and injure a playing partner. If your ball appears headed toward another player or another group, give them a warning by yelling out, “Fore’’ (an internationally recognized alert). Observe the safety suggestions posted in golf buggies and drive carefully. Ring the bells on the 6th and 8th holes on passing, and 11th tee on arriving, to advise following players that it is safe to play. Listen for these bells before playing your tee shot on the 6th tee and when approaching the 8th and 10th greens. The retrieving of balls from the pond on the 2nd is prohibited. Do not spend too much time looking for a lost ball, particularly if there is a group behind you ready to play. If you insist on taking the full five minutes allotted in the rule book to look for lost balls, golf etiquette says wave up the group behind to allow them to play through. When two players in a buggy hit to opposite sides of a hole, drive to first ball and drop off that player with his club, then drive to the second ball. After both players hit, meet up farther down the hole. When walking from your buggy to your ball, take a couple clubs with you. Taking only one club, then having to return to the cart to retrieve a different club, is a huge time-waster. Observe buggy and trolley rules. Stick to buggy paths wherever practicable and when directed by notices on and around the course. Keep them away from greens and hazards. Do not take them between the greenside bunkers and the green as the wheels can damage these sensitive areas. Please try to avoid damaging the course. Use your hand to remove the ball from the hole NOT your putter as this often misshapes the hole. Never talk during another player’s swing.